I was introduced to Amanda @The Quilted Fish last year when I chose to participate in the Modern Quilt Guild’s Riley Blake fabric challenge. The fabric they selected to use was The Cottage Garden, which was designed by Amanda. I jumped at the chance to participate because the colorway, patterns, and detail in her prints really spoke to me, and I created Lucent as a way to showcase the beautiful prints. So when Amanda contacted me to see if I might have interest and time to work with her newest line, Desert Bloom, it didn’t take long before I had a seed of an idea and was off and running! 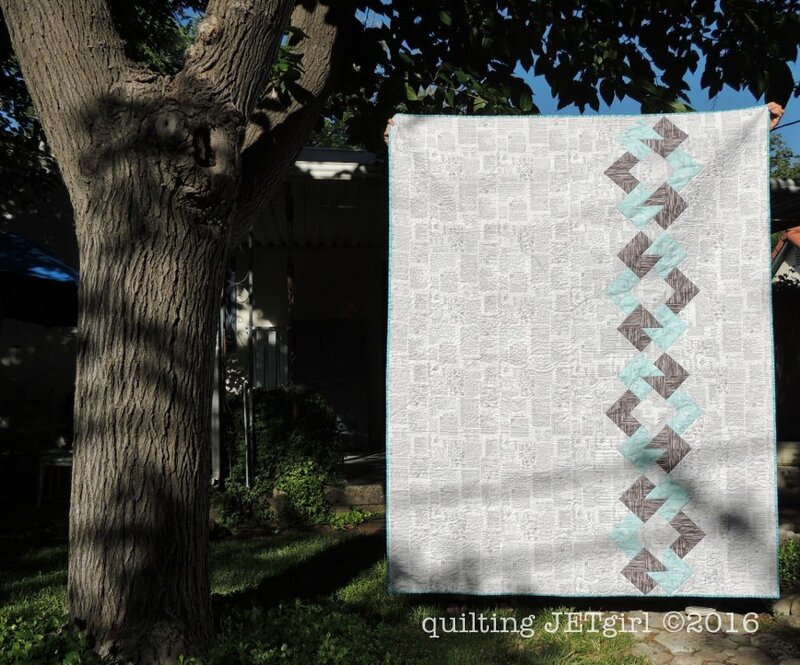 I am excited to introduce you to my newest quilt pattern today, Double Mobius. I’m going to step back for a moment and talk through the process of how I created this quilt and design. The first thing that really pulled me in about this fabric line is the name, Desert Bloom. I live right on the edge of the Mojave Desert (my husband commutes to work in the desert), and that connection spoke to me. The next thing that occurred to me is that my parents would be celebrating their wedding anniversary during the blog hop. In fact, today is their anniversary – Happy Anniversary, Mom and Dad! I also realized that I had never in fact made and gifted a quilt to my parents. Looking through the prints in the Desert Bloom line with my parents in mind, I selected the palette of 5 prints above. I love the Desert Text in White. It is a fantastic low volume print, and it contains lovely botanical terms and information, which made me think of my mom, who majored in biology in college and taught it in high school for years. The Desert Bird in Blue was an absolute delight to find as it was the perfect print to represent my father, who has a love and passion for flying his Bonanza airplane. I really love the graphic nature of the Desert Stripe prints and how they lend a more masculine feel to the balance of the fabric, and the Desert Main in Blue is the perfect print to pull the grouping together. As for the quilt design, when I was at QuiltCon in Pasadena in February, I shared a room with my mom and Renee @Quilts of a Feather. One morning, I pulled out my quilting idea sketch pad and doodled this design. I liked the connection that my mom was there with me when I designed it, and looking it over, I also liked how it felt like a modern interpretation of the double wedding ring. Because the design is a bit of a brain teaser, I chose to name the pattern Double Mobius. Mobius Strip: a surface with one continuous side formed by joining the ends of a rectangular strip after twisting one end through 180°. For the quilting, I used 50wt Aurifil: 2610 (Light Blue Grey) on the top and 6736 (Jedi) in the bobbin (because I did not have enough of either and the tones were close enough to blend). I wanted to use quilting motifs that complimented the botanical feel of the fabrics and filled in all the negative space with a fun combination of flowers, leaf vines, swirls, double loops, large swirls, stipple, back and forth lines, and a few occasional feathers. I also wanted to reinforce the anniversary and interlocking aspect of the block design and left a large un-quilted heart in the center of each Double Mobius. I love how the Desert Main in Blue works as the quilt backing, and you can just see that I placed a heart shaped quilt label inside one of the un-quilted hearts in the center of the bottom Double Mobius. The quilt itself took me 7 hours to piece, 5.5 hours to quilt, and 3 hours to bind (I hand stitched the binding to the back), for a total of 15.5 hours. To celebrate my parent’s anniversary and pattern release, the Double Mobius pattern will be for sale for $8 in my Craftsy and Etsy stores (20% off the normal price) for one week through June 21st. Thanks so much for visiting my stop in the Desert Bloom blog tour! If you are new to my site, please consider visiting Week 1 of the New Quilt Bloggers Blog Hop, where you will be introduced to great new quilt bloggers and where you can enter to win one of many wonderful giveaways from generous sponsors. 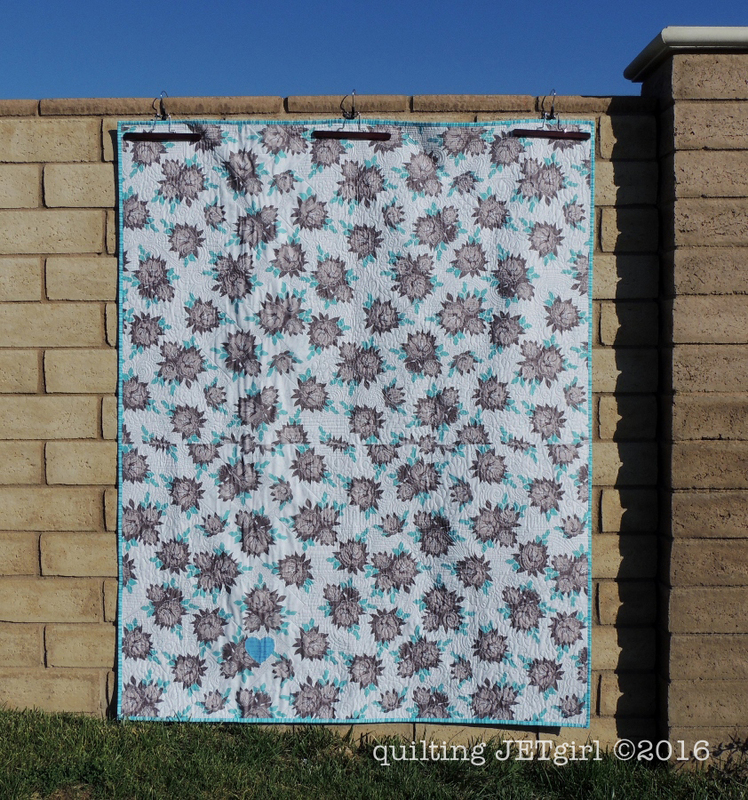 In addition to the beautiful quilting cotton that I worked with, the Desert Bloom fabric line also contains knits. Below is a link to the full blog tour schedule and so that you can see the other amazing projects that are being made and shared as part of the Desert Bloom blog tour! What a fun quit! And great how you managed to connect it to your parent’s lives. What fascinates me most is how you used all those different shapes in quilting, I couldn’t imagine something so different would work great when put together. Am I right to understand that the fifth fabric in your selection was used for the binding? These prints are talking to me, very loudly! 🙂 Definitely will be adding some of these to my stash. 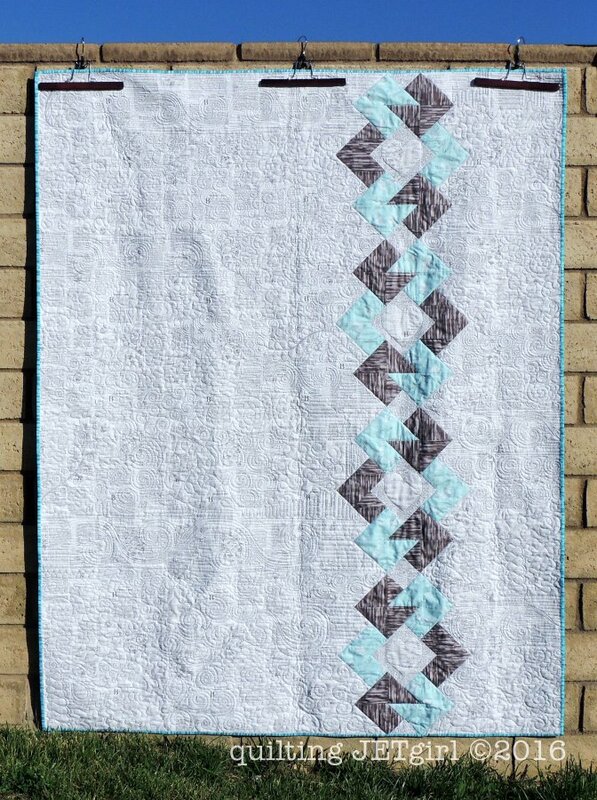 You’ve created another wonderful quilt Yvonne – congrats! Thanks for sharing the links of the blog hop, I’m looking forward to seeing what others do with this fabric line. I am sure your parents are going to love this quilt and the thought behind it! The text print is fabulous. I really like your modern take on the Double Wedding Ring! The hearts inside the prints is a perfect touch! This turned out lovely and yay for your parents! Congrats on your newest pattern! Yvonne, this is gorgeous! The fabrics are beautiful and the design is fascinating. I like how you choose everything with purposeful meaning. Yvonne, wow! 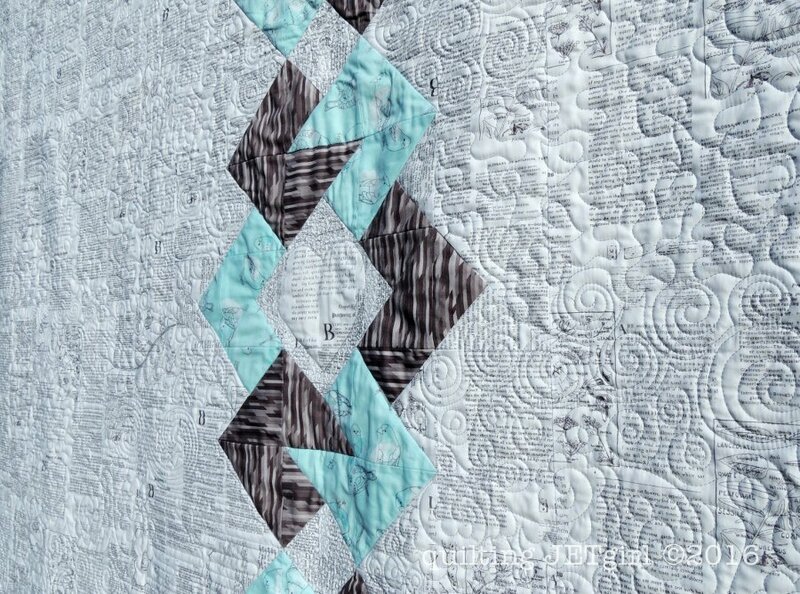 This is such a unique design – and the way you’ve mixed the various types of quilting (swirls, flowers, etc.) adds such visual interest to the blank space. What a great gift for mom and dad! This is beautiful. I love your design and quilting. I especially love all the thought behind every decision. What a sweet anniversary gift for your parents. I love reading all the details behind your design process, Yvonne. This is such a cool design with so much love behind it. Beautiful! And the quilting is fabulous!!! I love your modern take on the DWR! It’s so unique! This would also look great with another vertical column. I love that you chose that text print for the background – it’s lovely, and your quilting looks stunning, too! That is a really beautiful quilt. Fabrics, design and execution. The icing on the anniversary cake, is the meaning it has and what a lovely gift to your parents that they will always cherish. Congratulations, Yvonne!! Yvonne, this is a perfect give for your parents. I love how much thought you put into the fabric and pattern design, so that the quilt would be a representation of both your parents. Congrats on another great pattern! I love it! And the heart label detail is amazing! Great quilt! I love pattern and the different quilting designs you used in the background! Oh Yvonne this is lovely. So great great to read about how you conceived the pattern and the fabric choice. What a wonderful gift for your Mum and Dad – I am sure it will be treasured for yours to come. I am a huge fan of Cottage Garden (I still have a layer cake that I’m hoarding) and Desert Bloom is just as wonderful! I love the colors you selected from it. 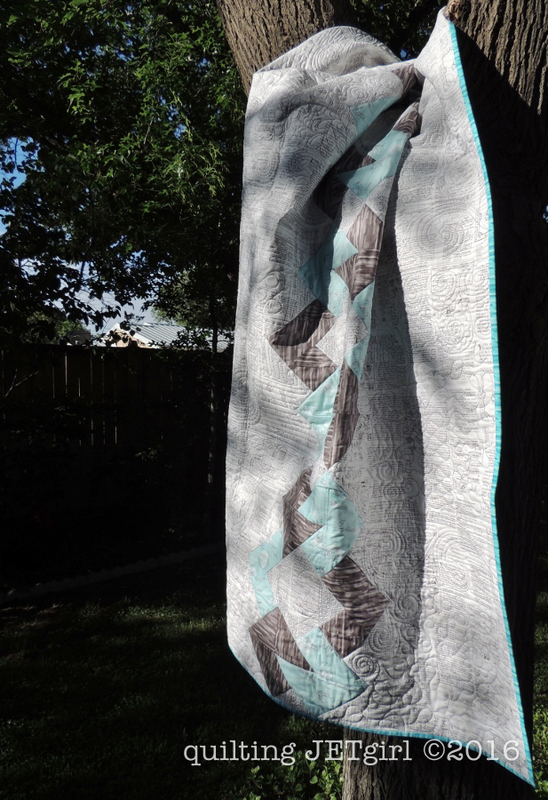 I’m always impressed at how much thought you put into every single detail of a quilt, especially the special meanings behind it with the botanical connections to your mom and the heart quilted label that nests within the mobius link. Such a special gift for your parents. Such a wonderful gift for your parents! I love that you were with your mom when you were inspired to design it. Great design, Yvonne! Two great reasons to celebrate! Congrats on a new pattern! This is a great pattern. So wonderful you were able to gift it to your parents. I’m sure they will love it. That’s a great fabric collection. Double Mobius is so packed with significance and meaning! Every inch of it is wonderful Yvonne and your parents must love it! A beautiful way to use the Desert Bloom fabrics and I love the ones you chose. This looks amazing! I love how the fabrics intertwine…gorgeous! Great combination with Amanda’s fabrics. I liked this post a lot, Yvonne. Love all the detail about how this quilt came to be, the significance of your fabric choices and your parents’ anniversary. You have also showcased the fabrics really well: there are a couple here I will definitely be stashing away. Really enjoyed this post and your design is great! i love the background fabric against the mobius – shows the range off perfectly! 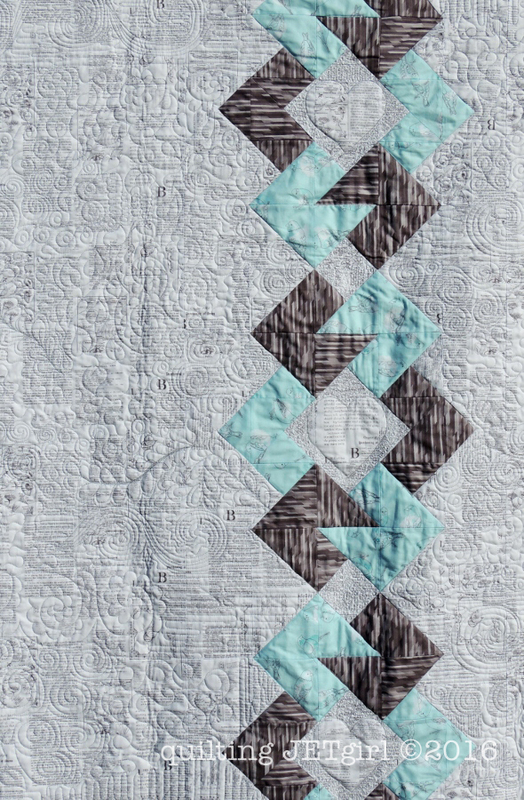 I really love the various quilting motifs you chose and how well they flow together. This quilt came together so nicely! I love the added movement and texture from the quilting, and those little puffy hearts are perfect for an anniversary quilt! Love how it’s become personal to your parents in so many ways. And beautiful fabrics, I’m really fancying the bird in blue in a knit, quite a few patterns I’ve seen recently which would be gorgeous in that, what was it you were saying about dangerous enablers yesterday? !